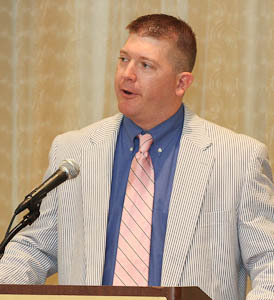 Following is the text of 1995 Scholar Ryan Sneed's address at the Byrnes Foundation 48th annual luncheon, June 11, 2011. A couple of months ago, the Scholars Board came up with an idea to do something to honor Mrs. Byrnes. And so it was decided that this Luncheon would be the avenue by which to do so. In turn, I was asked to do some research to look into the life of Mrs. Byrnes and prepare some remarks. However, this proved a very difficult task because historical research on the lovely Mrs. Byrnes always turned up an attachment to the Politician, James F. Byrnes. So, in turn, I began interviewing a few individuals that knew her so that I could begin to understand exactly who Mrs. Byrnes was – separating her individuality from the well known politician. What I quickly discovered in these interviews was that I could not separate them: As one individual I interviewed plainly stated, “You can’t separate the two. Mrs. Byrnes was as much a part of Mr. Byrnes as Mr. Byrnes was a part of her”, and their inseparable life began together in 1906. Four years after her graduation from Converse College, Ms. Maude Perkins Busch married James Francis Byrnes in Aiken, South Carolina on May 24, 1906 – Mr. Byrnes’ 24th Birthday. The two met while Mr. Byrnes worked in Aiken, South Carolina as the editor of the Aiken Journal and Review and working as a court reporter for the Second Judicial Circuit of South Carolina. Mrs. Byrnes should have known then that a man working two jobs that still had time to properly court her – as they said back then - and also marry her would surely be someone who had higher aspirations and would work tirelessly to achieve them. Shortly after Mr. Byrnes’ election to Congress in 1911 the two left Aiken, South Carolina and moved to Washington D.C. From there on, their lives were ruled by the political roles that Mr. Byrnes was called upon to serve in. No matter where the Byrnes’ lived or what political role Mr. Byrnes assumed, they both viewed themselves “of the people” never losing site of their humble beginnings defined by impeccable integrity and steadfast character. In order to get a better grasp of Mrs. Byrnes’ character I asked a simple question to those that knew her: What words would you use to best describe Mrs. Byrnes? Interestingly enough and without hesitation; most used the term “Southern Lady”. “Elegant” one said, “Gentile”, “Family Oriented” and “Gentle” were some others. They talked about how much Mrs. Byrnes loved to laugh and what a great sense of humor she had; How she loved to garden; And how she loved flowers, especially Camellias. They spoke of how much she loved to entertain! One person said, “If Mrs. Byrnes didn’t have a party to go to, she would have one herself.” However, both she and Mr. Byrnes preferred more intimate gatherings than large galas. Mrs. Byrnes also loved the holidays and spending them with her family in Aiken, South Carolina. Once, Mrs. Byrnes was given a recently “harvested” wild turkey by a friend close to the Christmas Holiday. She informed her family to not worry about the Christmas turkey, and that she would be bringing it. Simply described by Mrs. Byrnes sister-in-law, “that was one tough bird.” No more wild turkeys were allowed at the Busch family gatherings. At another holiday family gathering Mr. and Mrs. Byrnes brought along their beloved dog to Aiken. During the family dinner with everyone at the dinner table, the Byrnes’s dog and the Busch’s dog got into a fight under the dinner table. Mrs. Byrnes, quick to react, went outside – got the water hose – proceeded to pull the water hose through the kitchen into the dining room and hose both dogs down until the squabble over table scraps had ended. Mr. and Mrs. Byrnes also had a close dedicated friend that worked for them named Willie Byrd. Willie served as the Byrnes’ cook, chauffeur, housekeeper and dear companion. Once after returning from a trip to a garden nursery that was on Highway 378, just outside of Columbia in the Eastover Community, Mrs. Byrnes asked Willie Byrd if he would point out the Horrell Hill Community as she had friends that lived there. For those of you who know where Horrell Hill is, I’m somewhat surprised, but for those of you who don’t know it’s just a crossroads on Highway 378 headed towards Sumter. Apparently Willie knew this as well and told Mrs. Byrnes that she should have asked sooner because they had just passed it and it didn’t take much to miss it. Both Mr. and Mrs. Byrnes were very frugal people. As one person stated, “They lived nicely, but not extravagantly,” as they were constantly counting every penny spent and always taught others to save and plan for the future. Mrs. Byrnes was also very appreciative of anything anyone ever did for her and was quick to write a proper note of thanks upon receiving anything warranting appreciation. Mrs. Byrnes was a very intelligent lady and could hold a conversation on almost any topic. She and Mr. Byrnes watched the national news each night and carried on deep discussions on the political and social issues of the day upon the programs end. Mrs. Byrnes was a confidant of Mr. Byrnes and was quick to share her opinion on most anything with him and Mr. Byrnes greatly respected her opinion. Mrs. Byrnes’ adoration for Mr. Byrnes never wavered even upon his death in 1972. Anyone stopping in to see Mrs. Byrnes after Mr. Byrnes’ passing would most certainly get the tour of pictures that adorned the living room and office walls with all of the dignitaries both were fortunate to meet and stories behind them. One of the most treasured photos was the picture of Mr. Byrnes’ mother that she was quick to that one point out. Mrs. Byrnes was a very generous person. She either imparted or tried to impart her most treasured mementos of her travels with her close friends and family members. She gave one of her favorite niece’s a coffee table that was a gift to her and Mr. Byrnes from the President of the Philippines and even attempted to give others pictures off of her walls if she detected that you were enthralled by it. It’s obvious both Mr. and Mrs. Byrnes dedicated their lives to serving and helping others. With this in mind, the two began this Scholarship Foundation to do just that; to help you and me. Their concept of “generosity” in establishing this foundation was not limited to monetary assistance alone as they could have easily left the organization in the hands of an endowment or bank to issue scholarships. Their idea was to facilitate a sense of family and have an attachment and bond to a cause greater than the foundation that extends well beyond the years of collegiate education. In essence: A family. A family that shares the same impeccable integrity and steadfast character that was instilled in the Byrnes’ and a family that is generous and helps one another in a time of need. We are all here today as a result of Mr. and Mrs. Byrnes’ generosity and we are all family as a result of that same generosity. Regardless of where you are in the journey of being a Byrnes Scholar; in school, recently out of school, returning to school or never looking to go back to school, we are still Byrnes Scholars – and we are all family.